I create and share art with the intention of communicating and celebrating sacred, profound and beautiful aspects of life and spirituality. I aim to make work that references and communicates the vital connections that we are all invited to experience and share in. I choose to align with the universal current that recognizes life as spirit and spirit as life. If we claim to hold spirit sacred, then we must hold life sacred. And even if we do not believe in spirit then all the more reason to hold life sacred. I often think “spirit” is simply a word we use for all the interdimensional technology going on “behind the scenes”. My art is currently born of experiments and practices with drawing, photography, digital collage, alternative printmaking, mixed media painting and digital meets analogue airbrush body painting. The muses which I currently tap into to create my work include human and animal forms, sacred geometries, and nature. I use an old oil toner printer from which I assemble a collage of prints which I transfer to pre-painted wood, paper or raw canvass. The transferred image becomes a layer of the mixed media painted collage as I continue to work the piece with layers of paint towards my goal for a meaningful aesthetic. Harmonic resonance and impact are a plus. Visionary artist from Orlando, FL. Keiara is the founder of Auradornments Body Paint and designs wearable and functional art made from laser cut wood. She is based out of the Hudson Valley in New York State. Keiara enjoys challenging herself to design and produce art, and finds a sense of purpose in the act of creating. Art is a meditative practice for her. Keiara is a self-taught body painter and has been trained in jewelry design both domestically and internationally. Keiara holds space for each person she body paints to allow them to relax fully and have a calming and peaceful experience. The body paint designs are intended to reflect the individual’s inner beauty or auric energy through the use of colors associated with personality traits, moods, and chakras. 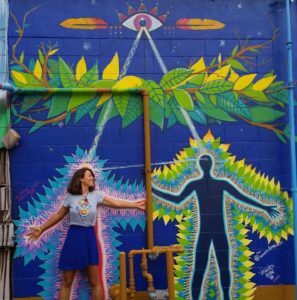 Keiara attempts to use her art as a way to bring positivity and healing into the environment and individual. She desire a world where everyone recognizes the divinity within themselves and within everything around them, and she hopes to contribute to this through her art. Amanda Moore is a New England based visual and performance artist who employs multiple mediums within her work. Her surreal visions conjure a magical tenderness that invites the hauntingly beautiful relationships between nature and spirit. She’s been described as an “Earthbound mystic who intuitively channels an awesome spirit within the boundaries of life and body, both of this world and other ethereal adjoining veils.” A wife and mother of two, Amanda has performed and curated community art events all along the North East Coast and has recently been a featured artist for Tomás Bürkey’s Pyramid of the Dead, a 2017 Black Rock City Honorarium project. Born and raised in San Diego​,​ ​​California, a soul forged upon the shores of the golden coast. Art and ​aesthetics have always been a part of my life​,​ from endless doodles on the backs of homework assignments to the perfect arrangement of objects within my space. The search for beauty in everyday life has always been a natural impulse of mine.​ Though I am self​-​taught, ​I have ​drawn​ wisdom from ​the many ​great masters that have come before me. By absorbing great works of art, paintings, architecture, music, film,​ &​ dance I am inspired by the human imagination, its forms, shapes, colors and textures and find great truths within all of its expressions. Always seeking to greater articulate the majesty of the natural world, art making and philosophy seem to be the greatest tools we have. The tools we use to tell our stories are very important to me, w​h​ether brush, pen, drum or hammer, how we wield these tools reflects our commitment to the craft. Observing the ripples in water, the patterns revealed in stone, soil, cloud and fire I draw upon all of this in my work. Creating art is a meditation for me, a way to calm my mind and bring me into the present moment, a therapy and friend. Attempting to breath life into the deepest parts of myself and observe that which grows from within. Through darkness and light, gems of wisdom are relieved to me to share with my community. I know that every one of us was born with special gifts and a deep calling to contribute to the human family, my art is an attempt at living the truth of that knowing. Every interaction we have with art and media creates an impression. Each of these connections are personal, natural and weave their way through the experiential structure of our lives. Our experiences inform our interplay with the world around us, and sit at the core of our personal ethics. The creation of artistic, interactive, transformative portals on any scale has become my focus of the past five years. These multimedia immersive light/ sound/ sculptural installations, focus on the viewers interactivity with the projection, sound and environment itself. When the viewer becomes the participant, the end result of the art has changed. Refocusing art on the viewers interactivity makes each experience individual. It is my belief that by building these installations, that I can bring a sense of community and wonderment that will last in all who participate. Elizabeth Sciore-Jones has an M.F.A. from the Herron School of Art & Design, lives in Ithaca, NY and currently focuses on creating a link between art, history, and interactivity. JenEye is an artist born in New York City, raised in Florida, and currently based out of Cali, Colombia. She got started with acrylic and a lot of doodling from a young age. In the midst of travels, she got the opportunity to start doing Henna at Disney’s Epcot with a Moroccan family, where she learned it more traditionally. Since then she’s taught workshops and done events in Tulum/Guadalajara, MX; Los Angeles, CA; Orlando, FL and Cali, Colombia. While still exploring and diving deeper into the art and rituals of Henna, she has recently began studying the art of hand poke tattooing from an artist in the mountains of Colombia. JenEye is a multi media artist. She incorporates henna into her work, to give it the essence that the art carries. She’s has traveled doing festivals, live painting, teaching workshops, and continuously getting inspired by the different cultures she encounters. Along with art residencies She does murals, illustration and has done many collaborations with artist from all over. Alexa Spaddy is a multifaceted creative expressionist. Born and raised in the rolling hills of Pennsylvania, her artistic roots stem back to the very core of her existence. Her visuals strive to cultivate feelings of empowerment and inner harmony as she fearlessly travels through the many avenues art has to offer. Alexa works in a multiplicity of mediums including paint, graphic design, drawing and paper making to name a few. Since 2015, she has been 1 of the 15 selected artists for Alex Grey & Allyson Grey’s Visionary Painting Intensive Masterclass as well as exhibited works in collaborative art shows in New York & Chicago. 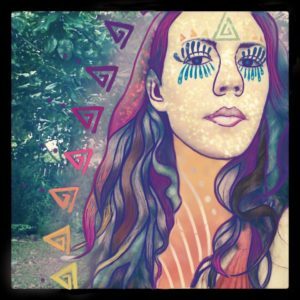 She was a featured Tribe 13 Live Painter at Luna Light Music and Arts Festival in 2016 and has live painted at CoSM Events. Alexa has a bachelor’s degree in Printmaking & Business from Montclair State University. 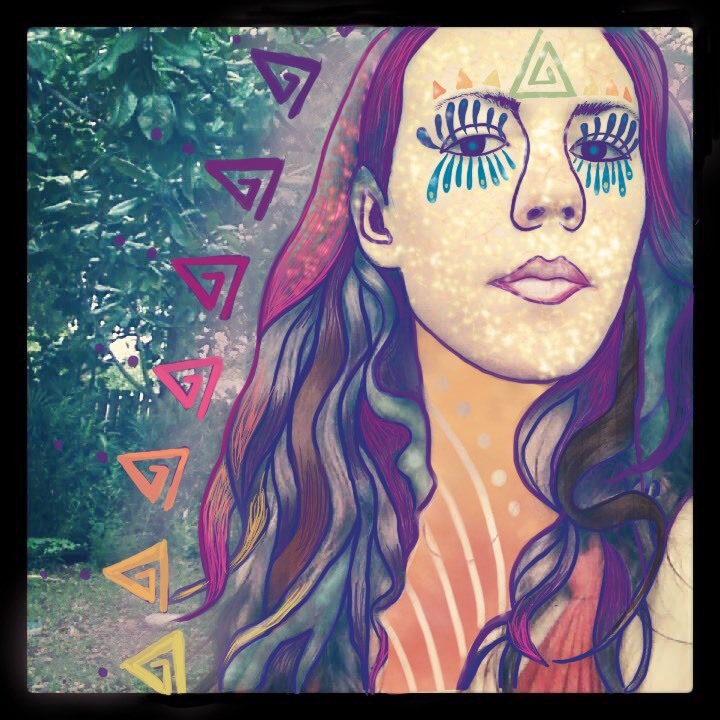 She currently resides in New York, working full time as Media Manager & Lead Graphic Designer for Alex Grey & Allyson Grey founders of CoSM: Chapel of Sacred Mirrors. cosm.org. Jeff Sullivan’s artwork is an attempt to build a bridge to the realm of sacred reality that exists within us all. Born and raised in Connecticut his artistic endeavors fluctuated between visual art and music. Seeking a creative profession as an educator he studied music for several years earning a degree at the Hartford Conservatory. After a profound mystical experience his attention shifted from music to creating artwork with sacred and transcendental attributes. The synthesis of music and art combined with meditative awareness and shamanic intent coalesced into a form of artwork with resonant, and vibratory qualities. His work has been recognized and featured in European art magazine Peripheral ARTeries, and the work has been displayed at healing and transformative art festivals throughout the country including “Lucidity” in Santa Barbara California, “Unifier” in Tolland Massachusetts and “Gratitude Migration” in Keansburg New Jersey. “I feel that art should be of service to humanity. Not merely to create new aesthetics but to serve as a sign post that points to the truth that we are one living being. It is only the mind made illusion that we are separate from oneness. Inspired by love, nature, and meditation he continues to peruse his artistic endeavors in Marlborough Connecticut. Hilary Astrid is a multi-media artist whose art is a sensory experience blending beauty and vibrancy. Drawing inspiration from all the facets of life, her art reminds the viewer of the beauty, ecstasy and mystery of living as a conscious being. During and since her graduation from the Rhode Island School of Design in 2013 with a Bachelor of Fine Arts in Illustration Studies, she has had exhibitions and painted murals in New York, Rhode Island, Connecticut, and Rome, Italy. She has taught art at the Omega Institute for Holistic Studies and continues to explore and expand her artistic studies through her work at the Chapel of Sacred Mirrors in Wappingers, NY.